1887: One of the leaders of the 1916 rising Joseph Plunkett is born into a privileged background. His father was a papal count. 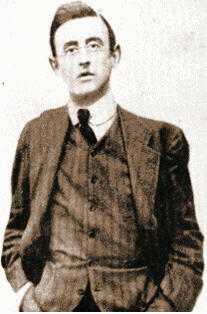 Joseph Plukett was one of the Irish Republican Brotherhood who planned and executed the doomed Easter rising. Hours before his execution by British authorities on the 4th May, Plunkett married his sweetheart in Kilmainham Gaol. A day of carnage in Dublin in an increasingly bitter and bloody Irish War of Independence. In a superbly executed operation, Michael Collins dispatched his agents to assassinate fourteen British spies (members of the so called Cairo group) in Dublin, effectively crippling the British information system. But the violence did not end there. In an act of revenge that forever stains the British military, British Auxiliaries forces drove to Croke Park, Dublin where a large crowd was watching Dublin play Tipperary in a football game. The Auxiliaries fired into the crowd. Between gunfire and the resulting stampede, fourteen people died. Overall the terrible day was a huge morale boost for the Irish independence effort and a disastrous and criminal blunder by the British who only succeeded in galvanising Irish opinion even more. 1974: Two bombs set by the provisional IRA devastated pubs in Birmingham resulting in the deaths of 21 people. A rush to justice by British authorities saw the unwarranted conviction of “The Birmingham Six,” Hugh Callaghan, Paddy Hill, Gerry Hunter, Richard McIlkenny, Billy Power, and Johnny Walker who were found guilty in 1975 of carrying out the bombings. Their convictions were overturned by the Court of Appeal in May 1991. The real bombers have never been identified or prosecuted although journalist Chris Mullin in his book Error of Judgment – The Truth About the Birmingham Pub Bombings claims to have met some of them.